The Lexmark E120 & E120n are monochrome laser printers that are small and light enough to fit on virtually any work surface but have a recommended duty cycle that can accommodate larger overall office demands. A focused and easy to use interface ensures excellent print quality and a robust and steady design provides for long term operation to protect a business's investment. User friendliness makes this printer convenient and very easy to use, no matter a person's level of technical expertise. A monochrome laser printing unit that utilizes one black toner cartridge, this machine has a print speed of 20 pages per minute for letter sized text documents ans 19 pages per minute for A4 size European media. The manufacturer advertises a maximum print quality of 1,200, which amounts to 600 x 600 dots per inch, which is capable of yielding reasonable print output quality with most text documents and some basic graphics such as business charts and graphs. This unit can print professional quality memos, invoices and letters with the greatest of ease and affordability. The rated first page out time is an average of 8 seconds, minimizing unnecessary wait times for single page documents. 16 MB of printer RAM enables continued and consistent printing of business documents without compromising speed for printer "think" times. 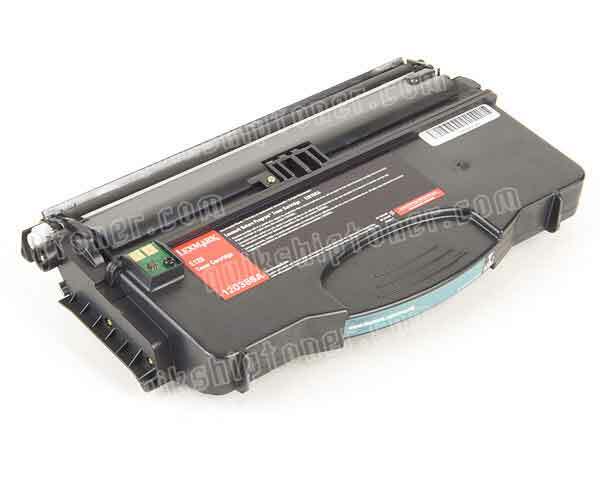 The Lexmark E120 & E120n has a printable area of all but a 4mm margin around the page. A monthly duty cycle of 500 to 2,000 pages is recommended, placing the standard output volume within the range of small to medium business needs. A maximum duty cycle of 10,000 pages can be handled in one month without being concerned with any extraneous and premature wear and tear, so companies can rest assured that this printer has the extra oomph when needed. A 150 sheet input tray comes standard, with a 50 sheet output bin and a 15 sheet priority feeder. 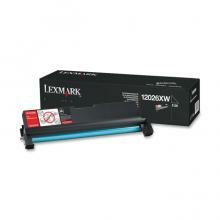 These capacities are rated for paper with an average weight of 20 pounds. The tray can also hold up to 5 envelopes at one time. A variety of paper sizes are accommodated, from the smallest European sheet sizes to 8.5 x 14 in. legal size. Media types supported include card stock, envelopes, paper labels, plain paper, transparencies and other special media listed in the card stock and label guide that comes bundled with the machine. A wide variety of operating systems are supported, up to and including Windows 7, according to the manufacturer's specifications, in addition to Mac OS X.
Ethernet 10/100Base-TX and USB 2.0 compatible ports are built in, allowing for direct connection to a PC or implementation into a network to be used as a shared resource. A cube design with an input tray that protrudes only slightly from the front of the unit is perfect for small offices and businesses with limited desk or table space. The compact design of this model features a shorter paper path, so breakdowns and paper jams are less likely. An intuitive control panel makes this machine very easy to use and provides fast, no-nonsense controls. Print speeds for this model are considered low to average by today's standards, as well as print quality. The limited amount of standard RAM cannot be upgraded and can be taxed quite easily when demands become highly graphic-based. 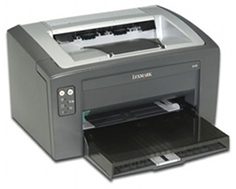 At a fully operational noise level of 49 dBA, this printer is considered to be loud by normal standards. With an average power consumption of 2.31 kilowatt-hours per week, this model does not merit an Energy Star rating, as it far exceeds the conservation standard. The maximum toner capacity in each cartridge is the same as monthly recommended duty cycle, so any extra printing required over that recommended volume will necessitate as much as 5 cartridge replacements in that month to achieve the maximum output of 10,000 pages. Review it: "Lexmark E120 "
One black toner cartridge is available for the Lexmark E120 & E120n, that has an average yield capacity of 2,000 pages at 5% coverage. The cost of toner per page, with current average cartridge prices, is roughly 2.5 cents per page.